2 days ago a teaser-puzzle was posted as Picture-Of-The-Day. The puzzle itself was not a very difficult one. You know that Heroes 4 supports 3 different resolutions: 800*600 px, 1024*768 px, and 1280*1024 px. These resolutions have display ratios of 4*3 and 5*4. Our screenshot is has ratio of 16*9, which is visibly longer. If you open the screenshot is separate window (just drag an image to the tab bar of your browser) you can see it's Full HD: 1920*1080. Of course, it's not the final menu version. Of course we will add more resolutions. But what is important right now - it's finally working! There are a lot of issues to resolve. Some of them have nothing to do with programming. This is our call for Artists. We need a proper main menu picture which will look good in different resolutions. You can see that left and right sides of the screen are mirrored to make screen longer. This is just a patch, we need much better version. We need it drawn to make it look as organic as possible. Or, if you are ambitios enough, you can draw a completely new town screen and we can place all buildings where they need to be. If you have a good idea what to put instead of our logo - plese share with us. Exciting, but it does beg a few questions. Is there an editor? I am assuming equilibris is included, but will they all run in Win 10? Thank you guys, that's best Heroes of M&M news since I cannot remember. Romanov77 wrote: Thank you guys, that's best Heroes of M&M news since I cannot remember. And it is not surprising that the news came from a source other than UBI. This mirrored town image doesn't look so bad. And what about battle screen? How does it look? jeff wrote: Exciting, but it does beg a few questions. Is there an editor? I am assuming equilibris is included, but will they all run in Win 10? Win 10 compatibility is unrelated, although very important issue. Can't make any forecast yet. It is high on our priorities list. Taro wrote: This mirrored town image doesn't look so bad. And what about battle screen? How does it look? One of the problems with battlefield. Initially the graphics part was designed the following way: 1280*1024 was considered a primary resolution. All 3D models were rendered for it. Then if you chose other resolution, all graphics was scaled down. When you scale graphics down, you can lose some minor details, but the picture doesn't look bad. But now we have to scale up, and graphics starts to look low-res, pixelized. It's not terrible, but enough to notice. why not handle it in the same way as the Heroes 3 HD mod? also how much of the game is blown open for modding now since you guys joined forces? Heroes 4 also has some very bad problems with v-sync and scrolling. Last time I tried it it lagged like hell. Erwinner wrote: why not handle it in the same way as the Heroes 3 HD mod? I don't know the way they handle it in Heroes 3 HD mod. We did not join forces with them. Max_HMMI has found some very efficient ways to do the most boring and unproductive parts of work with exe-file modding. So we cut the development time significantly. These new ways don't work in every case, but in many cases they do. 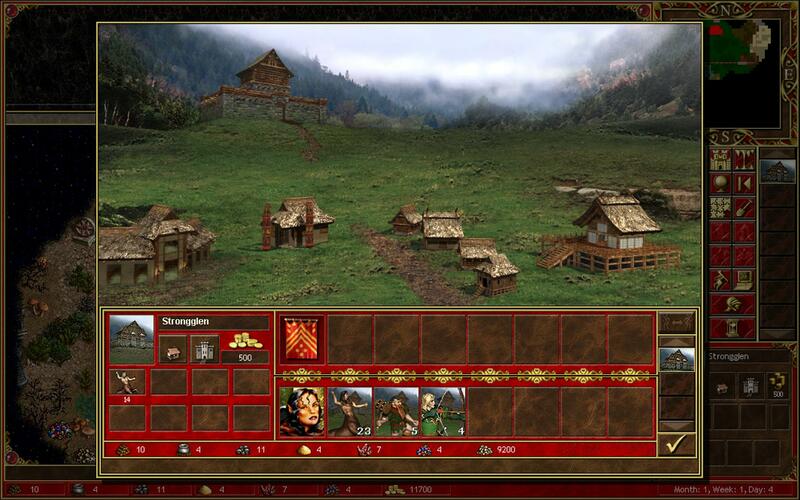 Romanov77 wrote: Heroes 4 also has some very bad problems with v-sync and scrolling. Last time I tried it it lagged like hell. Do you mean the problem with animation on strategic map, when you have to turn it off? Dalai wrote: Do you mean the problem with animation on strategic map, when you have to turn it off? Yes, I foind that at 1360x768 the game (other thank looking horrible, stretched and big) had massive lag and tearing. Until it crashed. This happened on a gaming rig, not some potato laptop. Dalai wrote: I don't know the way they handle it in Heroes 3 HD mod. We did not join forces with them. Well, I am sorry to bring the obvious, but maybe you should indeed deeply investigate what they did and how, then even talk to them and see if things they did can help you. Because HD mod for H3 is a hell of upgrade, properly coded (not like wog) and structured -hence easy to learn from, 99% stable and with dozens interface and game play tweaks. The most interesting -for you probably- is that he didn't have to modify any of the dynamic graphics, as towns or creatures, but only interface graphics. I could try to help you with graphics for menu and town screens, but I will have free time fastest after two weeks... and I'm not promising anything, because I also work on other projects... and the school. When it comes to the main menu, I think that the easiest way would be to prepare a new graphic. I could also enlarge the original, but because of the amount of detail that would not be easy. Working with Town backgrounds will be much easier. Anyway, it's a lot of days of work. Ps. You can send me the necessary graphics just now (I mean the menu background and the backgrounds of towns). The option with windowed town- or combat-screen is very similar to one of two options we are considering. First option is more natural from programming point of view - to do the same thing that 3DO did and upscale graphics. The second option is to do something similar to what is done on screenshots you posted. Not exactly make it windowed though, but rather add some "passive" "flavour" space around the actual battlefield - bushes, trees, rivers, etc, leaving "active" graphics from 1280*1024. What I am pretty sure of - we are not planning to redo objects from scratch Not unless Ubisoft releases 3D models, at least. J. M. Sower wrote: I could try to help you with graphics for menu and town screens, but I will have free time fastest after two weeks... and I'm not promising anything, because I also work on other projects... and the school. I understand it's all time-consuming. That's fine, we have time. I think I'll post a link to archive with backgrounds and main menu screens when it's ready. May be someone else will want to try doing something before posting here. I'm not going to block jobs for other artists. If another artist was willing to work, then do not be embarrassed and also works. Ps. One fan from the AcidCave sent this link. I'll try to use it somehow. I won't exactly call myself an artist, but I'd be willing to lend a hand with stuff like extendibg Town screen and the likes. Creating new graphics is beyond my talents, but I might be able to work with existing ones, I'm willing to try. Anyway it's indeed great to see all the stuff you're working on. Perhaps not the most original of Ideas, but I just recalled a few b/w pictures were in the Interview with Terry Ray. Perhaps they could fit all resolutions and be colored? 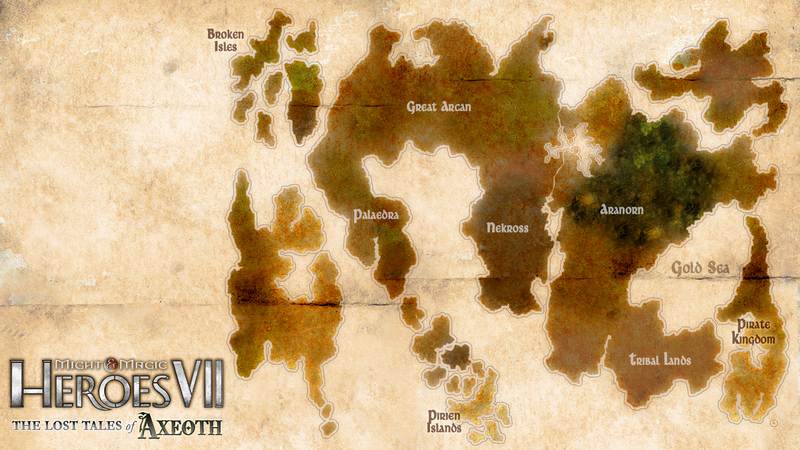 There's also the 'official' world map, though that might not be the most interesting main menu picture. Like Karmakeld said there is an official map of Axeoth in HD: https://ubistatic-a.akamaihd.net/0004/prod/images/150911_Lost_Tales/Iranese.jpg. In my opinion it will be a great replacement for the existing one in HD mod, bringing some fresh air to this not-so-young game. For the town and battle screens it would be the best to make them "windows". Also lower 16:9 resolutions will be supported? Like 1366:768? I would really want to play one of my favourite games on my laptop without black stripes from 1024:768 resolution.